So if you know me at all, you know I'm a huge Harry Potter fan... I couldn't help but think of the scourgify spell as I raked the grass clippings from the area that will be my expanding raspberry patch next year. 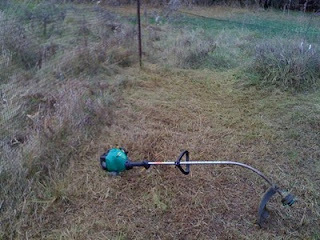 To prepare for tilling, I used my ever finicky weed whip to essentially buzz cut the space. The grass growing there has been there for a very long time and had formed a thick thatch that any tiller would groan about. On top of that grows a good 2' tall stand of dead or dying fall grass. It's very satisfying to hold the weed whip on an angle and cut straight down to the soil. 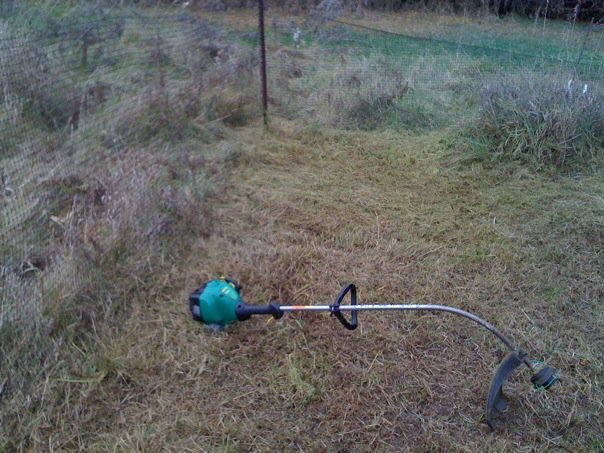 Of course it's a lot of stress for the whip and that's probably why it's so finicky in the first place, but it sure beats doing it by hand with a thatching rake! You can see in the first photo on the outside of the (ever sagging) deer fencing that the grass is tall and thick and would be impossible to till over. The additional bonus in all of this is the grass clippings afterward. Our landlady has a lawn crew with a super efficient mulch mower and so access to grass clippings is pretty minimal for me. Grass clipping are essential in lasagna gardening and since I'm giving that a shot for my raised cinder block beds I'm in dire need of "green" compost that will produce nitrogen as it breaks down... Of course I do have the duck manure which is full of nitrogen, but I remember reading that nitrogen from manure fixes differently into the soil than nitrogen from grass clippings. 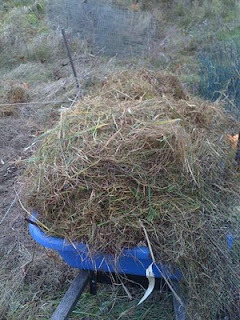 I got an entire wheelbarrow (contractor size, too) full of grass clippings that I intend to shred with my leaf shredder and then add to my raised beds. Not a bad haul for a cloudy November morning! 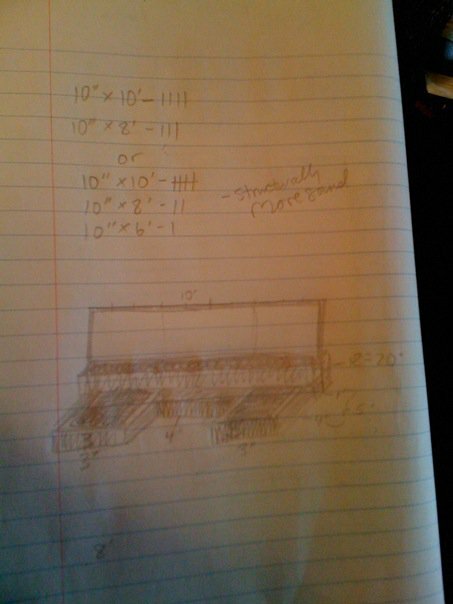 I had originally planned to use white pine boards for the new beds, but I looked at the prices and realized it would cost me less than 2/3rds of the price to creatively use 4"x1"x8' furring strips instead. They're cheaper, but they're also a little more warped and less carefully milled. Still, it saved me over $25 so I rallied to the challenge. 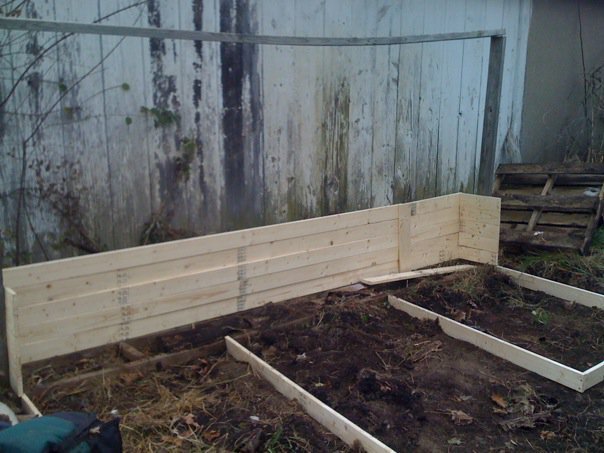 I laid out the beds, with the back 10'x1' bed being roughly 22" deep. 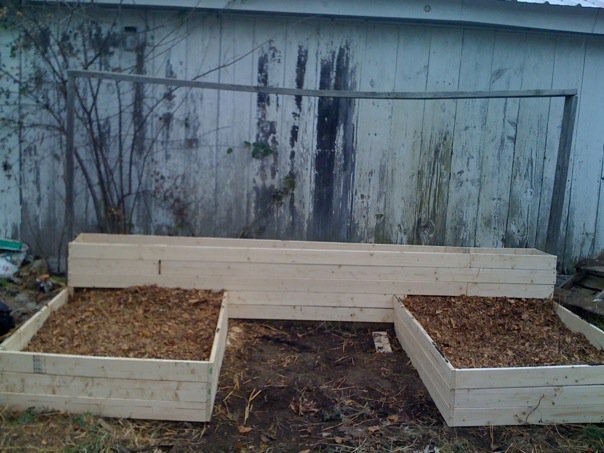 This is the perfect site for square foot gardening. I plan to put 8-10 vertically pruned tomato plants there next year, with some narrow root crops interspersed (carrots, radishes and parsnips). They'll be trellised on the top of the old structure, which I may end up painting white. The front beds ended up being around 10" deep and 4'x3' in planting area, and I put a base of old planting/potting soil that I'd scraped up from around the farm and composted over the summer. 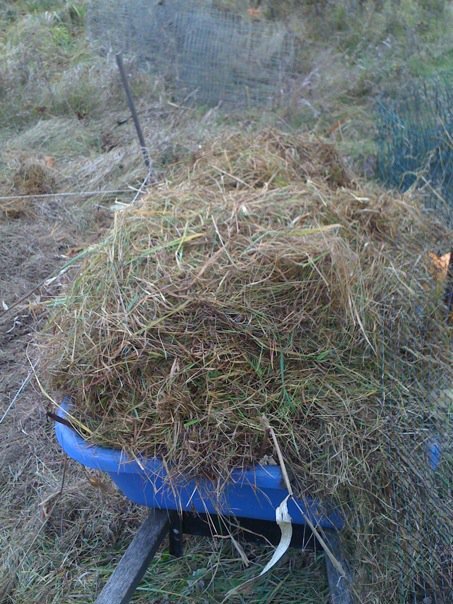 I followed this with a layer of shredded straw and duck manure (which will decompose enough by spring for planting). 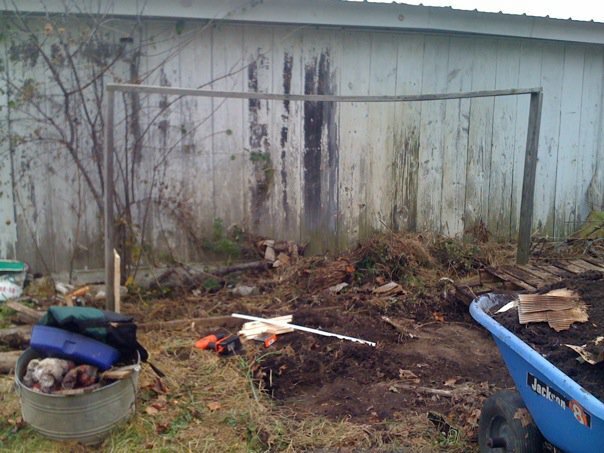 After the duck manure I added more finished compost, and a layer of shredded leaves. I had planned to use the shredded leaves everywhere this year, but my ever efficient landlady sent the yard crew over to mower mulch them while we were running errands. I was pretty devastated until my mom pointed out that I work on a horse farm with... well... a forest behind it. There's no shortage of leaves there! I also plant to gather the leaves from the sheep field to shred later this week if we get some non-rainy days. My final decision was to add a potting bench between the two beds. Unfortunately I ran out of wood and had to leave it as a simple bench for now, but my plan either for this fall or next spring is to add a solid box underneath the bench, and to add hinges on the top of the bench. This will provide storage for summer garden tools and (get this!) I'm going to use it as a cool-season mini root cellar for late fall and early spring! All in all, this project cost me just under $50, including screws! A great success in my opinion. Here's a quick post about my woven-wire fencing adventure yesterday, during which I got more than 1/3 of my fence up all by myself! I built myself a woven-wire stretcher from two pieces of scrap wood and some old screws, then I stretched it using a cable-winch. It was SO cool! The fence went from a disaster - all warped and wonky - to taught, level and ... beautiful! Then I added my stretcher and the cable winch. I accomplished so many tasks today! Posting my list really helped me focus on what I needed to get done. The best part was this afternoon when my DH and I went to the local compost yard and picked up an entire cubic yard (actually, slightly over) of compost in the back of my Subaru station wagon. I'm always amazed at what we can fit in our wagon; it's been a fantastic vehicle when it's not broken down, that's for sure. Jeremy is so amazingly supportive. He's always willing to help me outside if I need it, even if it entails pounding fence posts or stacking firewood. I'm hoping to get at least two more yards of the stuff before winter. It's very cheap, high quality and local! Unfortunately, it's also almost gone for the year. They only screen compost until the end of October, and they probably only have 5 or 6 yards left, so I'm hoping to get back over there this weekend or early next week to see if I can get at least another yard, if not two... or three! I love dirt. I feel more at home completely covered in dirt than I do clean, especially if it's clean dirt, like freshly turned compost! In addition to the compost, I walked the entire main sheep field and gathered whatever burdock I could find. Unfortunately this was a lot of burdock, and I worry that in the great number of bushes that I pulled, hacked and destroyed a lot of burrs were lost. Sheep are fantastic at finding burrs. They're like little burr-detectors... I'd like very much to blanket my sheep, but I can't bring myself to buy blankets, I would much rather make them. It seems like a few years ago one of the spinning magazines had an article on how to make fleece covers, but it's hazy and I can't remember where or when it was published. This barn is such a hodgepodge of addons and patchups. This is made evident most by the fact that the adjacent stall wall cuts into a window into the main barn. I love it though. It's full of history, and it's had a fascinating life. Unfortunately the foundation has crumbled, though it's still standing soundly. The leaning west wall is a sign that this poor building certainly won't stand forever. Another sign is that the roof, which started to leak obviously years ago, was patched with the same stuff the west wall was. Corrugated aluminum. Ugh. My other task was to clean the roof of the barn. The same box elder tree that is destroying the foundation of the barn was also crushing it from above by growing directly into the roof. I spent a good chunck of my day 15-20 feet above the ground, sitting in this tree with a bow-saw, a pair of loppers and a large garden rake, which Jeremy so graciously brought me. I had a great perch and I worked carefully to saw off the branches that were growing into the building, clip branches that would do so in the future and scrape the debris (years of old leaves trapped by the branches) from the roof. The photo on the left was the view from my perch in the tree. On the right here is the mess of branches and debris that had to be removed. I really should get up there and tack down the loose sheets of aluminum before winter, but it's a two person job I think since ladders aren't my forte. Again, I have one of the most supportive husbands I can dream of. After a quick cellular call from my perch in the tree, he ungrudingly brought me my tools to take care of the barn roof. What a great guy! This morning I figured I would post a few of my more reasonable lists so that I have a published place to refer to them in case I'm out and wish to check back on them via my phone. put in final two T-posts up by the barn - check! cut down the two dead portions of the box elder by the barn - check! scrape the dead leaves off the roof of the barn - check! put up woven wire - this weekend or else! - check! buy one more gate for the west paddock fenceline - check! buy water trough heater - check! bring home small tack box from horse farm and install as "sheep emergency box" - check! order motion sensor light for barn door - check! 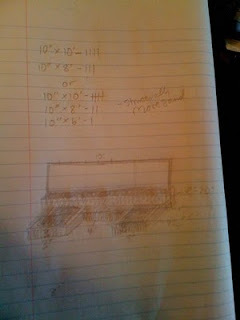 calculate numbers of grass hay vs alfalfa hay for late-gestation ewes - check! order hay from Kevin - check! prepare lambing kit - check! order woven electronet - check! possibly pull down the old metal siding on the west side of the barn and reinstall or replace - half-check! Pick up tiller from Don's Small Engine Thursday afternoon - check! Till first bed under and spread duck manure - check! Till under and supplement unplanted rows in raspberry patch - half-check! Reinforce deer fencing on raspberry patch with additional T-posts - check! Rake, shred and distribute leaves and leaf-mold - check! Pick up preferably no less than 3 yards of compost from compost yard - half-check! Lasagna layer raised beds - half-check! 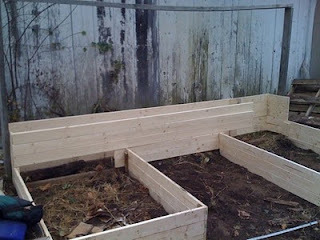 build tomato box and supports to replace cardboard box garden - check! Graze ducks on front veggie bed leftovers for fertilization - check! 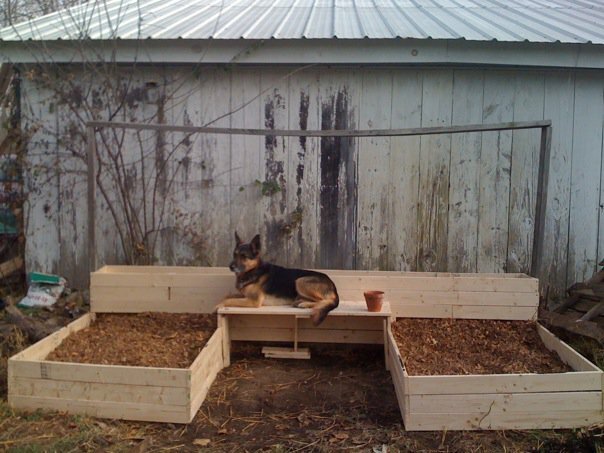 Compost cardboard gardens (maybe turn into lasagna layers?) - check! So obviously I have some maddeningly big plans for the rest of this year, but for the most part as long as I stay on task I should be able to get them done. My brother is supposed to be coming out this Saturday morning to help put in the woven wire on the sheep pen. I originally wasn't going to admit this but it's become an advantage rather than an embarrassment so I'll go ahead and own up to it. I installed my tposts backwards. Originally I had intended on keeping the woven wire on the inside of the tposts because it would add physical integrity to the fence if the sheep were to press against it. When I discovered the posts were backwards I was so overwhelmed I didn't even get frustrated; I just laughed hysterically. Now I'm realizing I like them this way. The neighbors dog, albeit adorable, is deaf and has charged and damaged our front welded-wire fence a couple of times, and being a very solid dog with little inhibitions (I think she's an american bull dog?) she worries me when I think about sheep, lambs and this dog's ability to bash head-long into fences. With the tposts set the way they are, I am forced to put the fencing on the outside which means more resistance to any pushing or bashing from outside the fence. My dogs have been exposed to various livestock and I know that while Connor will ocassionaly rush a horse out of fear, all I need to do for him (and Basil will learn from him) is establish that he has a job with the sheep and they are his to take care of. We did this with the ducks and he's pretty awesome with them. Sometimes his drive instinct still overpowers his herd instinct and he takes the ducks down the driveway while I chase wildly after, but he still thinks he's doing his job and he still knows they're a resonsibility, not a play thing. finish west and south fence - check! check duck coop for holes - foxes have moved into the neighborhood! - check! Put up bird feeders out front, and at the bottom of the yard - check! We have been enjoying some of the strangest weather this fall. Last night's low was a frigid 24 degrees, and today's high? 65! It climbed 40 degrees in less than twelve hours and the consequence was fog. Lots and lots of fog, and dew too! I managed to stay nestled in the house for a bit before venturing out with the dogs. They had a blast zooming around the yard and down into the orchard. I haven't seen them play so hard in months so it was fun to watch them truly enjoy themselves like that. I snapped a couple of photos while I was tromping around, and then I came across the most awesome display of spider webs I've ever seen. They were on everything! They lined the fences, and draped gracefully over each and every stand of grass that the dogs hadn't trompled yet. Even more, they were lined with the most delicate dew. The whole field sparkled and shimmered. It was beautiful. Shortly after the sun burned the fog away I got to work on the raised bed again. I have it fairly level and lined with cardboard, so I started loading in a bit of soil/compost to line the bottom. I'm going to be doing some lasagna style gardening I guess. I didn't even know it was a gardening fad until my mother described it for me. I've been layering stuff for a few years without even knowing. It's kind of fun to look at all the information now and apply it to what I've learned and what I want to try. 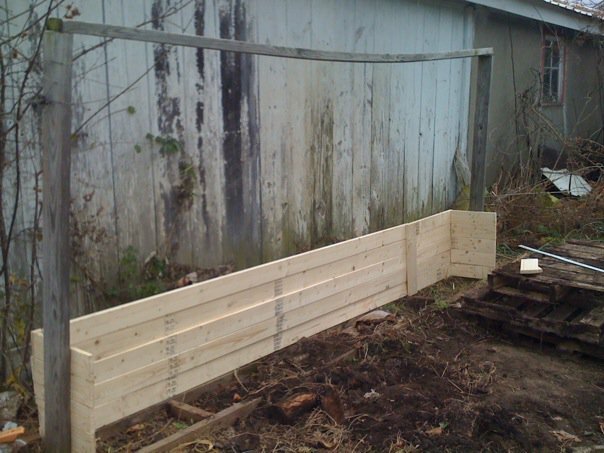 I've got two more of these beds to put in, hopefully getting them level and lined tomorrow, before making a run to the local compost yard to buy several cubic yards of compost to complete the beds with. I'd really like to put another set of these beds on the opposite side of the orchard path, but we'll see. Theyre not terribly expensive. The blocks cost me roughly $20 a bed, the cardboard is free and the compost is $9-11 a yard so not even counting the space taken up by soil and straw/manure from my own stash, the beds cost me roughly $30 a pop to put in and they'll be around for year after year, and I'll finally be able to grow (short to mid length variety) carrots! I'm really just trying to occupy my time while my tiller is in the shop. It needed the carburetor rebuilt, and when they went to take it apart they broke one of the pieces on the gas line (ARG!) so now we've had to wait an extra week for that piece to come in... I'm so frustrated, and when I get frustrated, I ... plan gardens! Haha. Michigan is known for dropping twenty degrees over night (60's to 40's, or even 30's in 12 hours) to start off the winter season. So far we've had at least one drop like that, but then a week later we were back in the 60's. The forcase for now looks like 60-62 daytime highs for the rest of the week, and sunny. If we had a smidge more rain I'd be a happy (albeit skeptical) camper, but I guess I should just enjoy this while we've got it. I'll be eating my words in a month when we're frozen solid! I pulled my horses blankets off after the bit of freezing rain we'd had while I was out of town this weekend and they were all happy to lose the bulk so that they could go roll and run around like maniacs. Of course after pulling their blankets on they all refused to be caught for their lessons and caused quite a stir while I ran around with treats trying to calm them down. They really can be a tricky bunch. They're all mares, 5 arabian, 2 half arabian, and their intelligence makes them a real challange when they work together! The winter is always a financially trying time for us since I am a professional riding instructor and my DH is a professional comic book artist/creator. My income really depends on the weather so if we have a mild winter, everybody gets to eat well. If we have a rough winter it's ramen noodles and straight grass hay! Of course our animals eat better than we do most winters, but that's a fact I've come to embrace. Harrison kept trying to get Basil to play with him, but Basil was far too preoccupied by her nerves. No sooner than I'm half way through preparing for one endeavor, I'm on to another! I'm thinking chickens. Our ducks are wonderful, I love the Khaki Campbell breed and they have really intense and unique personalities. Their eggs are tasty, albeit large yolked and heavy, but they lack a lot of the greasy texture that most duck eggs have. The ducks are pets, and I love them dearly. What I'm really hoping for is a fast growing dual purpose breed that I can grow and then cull all but a small handful of the best, leaving them for layers. Of course I have to find an opportune moment to introduce idea to the land lady... I'm hoping to win her over with promises of organic, locally raised chicken meat and eggs. Whatever I end up with needs to be either dual purpose or... I may just get two breeds, a layer and a meat breed. I really hope my landlady lets me get chickens. I have the inside of the barn all planned out if she does. There is perfect space for two chicken coops, and I'd love to build a chicken tractor (see left) to move around my various gardens to fertilize and nibble the baby weeds. I wonder if she reads my blog... Hmm.. It wouldn't be hard for her to find if she really looked. Well the wintery mornings have already begun here in Michigan. This morning was a frigid 24 degrees Fahrenheit and there's no way I was going to brave the out-of-doors before the sun peaked over the horizon. The biggest thing on my mind right now is a cup of tea, and our kettle is broken! It leaks terribly, but of course that's an excellent excuse to get a new one and we've had our eyes on a couple of colored enamel kettles so it's not all bad; it just means I can't have a cup of tea this morning. There are only a few things left in the garden to harvest this year, which is kind of depressing but at the same time it leaves me with a lot of clean slate to be excited about for next year. I've got leeks and parsnips left, as well as some spinach, peas, winter radish and brocolli growing under cover. Unfortunately I think I have failed yet again at growing brocolli. I've never had a lot of luck with it. This time I managed to dodge the cabbage loopers but for some reason it has refused to produce buds and thus I am left with adorable clusters of brocolli leaves and that's it. Boo. The parsnips seem to have grown well in the cardboard boxes I had planted them in. They're are nearly all straight and plump, though a couple of them are split and look like they have legs. It was my first time growing parsnips and I'll definitely do it again. They are a long season crop so I'll have to find somewhere out of the way and rabbit-proof to stick them next year. They took up space I could've used for things more pressing this year. My final photo is a quick shot of our Collie/GSD, Basil, enjoying the evening sun in front of the newly pounded fence posts. Other than evening out the heights of the posts, we're ready to put up the woven wire so assuming the weather remains in reasonable temperatures this week I'll be doing that.